With the ongoing rise in the role that images play in social media, the travel industry in particular has been influenced by this trend. Whether you are posting images to your Facebook page, including pictures with your Tweets, adding photos to your Flickr galleries, or pinning pictures to your pinboards on Pinterest, images are infiltrating all social channels. It’s becoming increasingly evident that social media channels are refining their functionality and interfaces in favor of visual content. With the recent transition of Facebook to the Timeline layout, the profile and page altogether is now dominated by visual elements. Not only this, but the platform for apps added to your page has been expanded from 530 to 810 pixels in width, offering significantly more real estate for creative and image-based elements. As well, Pinterest, a channel based almost entirely on sharing images, has become the 3rd most popular social channel with 10.4 million users. Most recently, with the transition of Google Places to Google+ Local, images are more prominent and visible than ever on this local-based channel. When choosing a destination, visitors want to take a visual tour of their potential destination; images give guests the liberty to interpret the destination, and social media gives them the opportunity to share their travel itinerary in a visual way – and the popularity of this trend is clear. 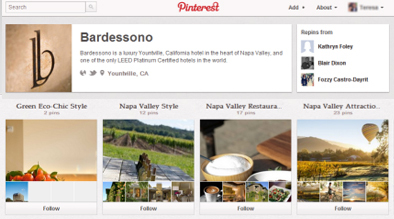 For instance, on Pinterest, Travel & Places category is within the top 10 most frequently pinned-to category. In February 2012, RJMetrics reported that the 3rd top source of pins on Pinterest was Flickr.com, another image-gallery based channel. So, how does this trend towards image-based social sharing effect hoteliers? With the rise of these image-based channels, it is important to ensure that each of these channels is working in conjunction with one another. Use the successes of the various channels to enhance one another. Upload your images in one place, and share them throughout your portfolio of social channels with relevant content to the audience of that platform. Of all of the activity that occurs on Pinterest, more than 80% of all pins are repins – use this to your advantage. There is a great chance of organically expanding your social reach of your images by adding them to Flickr and pinning them from this gallery to Pinterest. Ultimately, images are an excellent way of reaching a greater potential audience and making an impression on visitors of your social channel for your hotel. In conclusion, as the variety of channels that are available to social media marketers and hoteliers are becoming more complex, it is clear that images can create an impactful impression of your hotel and destination. Invest in imagery that is flattering and high-quality, and allow visitors and potential visitors to interpret the photos and build their ideal vacation around them.